I cannot believe it is August already! We are on vacation right now so, I won’t be able to visit anyone’s tablescapes until I return. But, I am looking forward to seeing them! The only second hand items on his table are the napkins. Everything else is brand spanking new (well, at least bought brand spanking new!). I started out with my .59 cent yellow bamboo placemats (Christmas Tree Store). I am going to start out by showing you the clearance price of these dishes. Now, $1.50 a plate is actually quite a high price for me to pay. so, this isn’t my most thrifty table. But, these were just so fun, they begged to come home with me! Let’s start our worldwide travel in Venice! Next we are heading over to Paris for a little shopping! Next, let’s swing by London! And we will all meet up back in the States in New York! These green acrylic glasses were clearanced at the Home Goods Store (.75 cents each). These aqua blue wavy glasses were from the Dollar Tree. The large red wood lantern was a clearance find at CTS. It was marked down to $1.47. I decided to double up on the napkins. both sets were under $1.00 at thrift stores. How fun are these orange and gold beaded napkin rings! As you can see, I bought them at Pier 1. Originally $3.95 each (gulp!) but, clearanced down to $1.88 each. So, that would be $7.52 for the set of four I bought. No way! That is way too expensive for my budget. So, if I wasn’t willing to pay the $7.52 how did I get them? If you are a follower of mine on Facebook, you probably have already guessed how. Last week I posted on my wall about the great coupon I found! It was for Pier 1, a two day only sale and the coupon was for $10.00 off a $10.00 or more purchase! So, yes siree, these napkin rings were FREE! I also got the faux pomegranates and the cute little orbs for FREE as well with my $10.00 coupon! I was so excited to find out that I could use that coupon for clearance items!! So, if you don’t follow me on FB, you could be missing out on some fun bargains I find online and share! I don’t post them on my blog, just on FB. This was a really fun table to put together. The plates and the orbs made it a bit playful. And I enjoyed playing with all the fun and bright colors. Well, I hope you enjoyed my new but, clearanced and free Trip Around the World in dishes tablescape! Now, I can’t wait to see your Thrifty Tablescapes! What a cute idea..love the plates. I love those plates!!! I would love to have some like that. I've seen the black and white ones at TJ Maxx and even in brown and white, but I've never seen any that colorful. Oh my goodness, I love those dishes!! Your tablescape is just beautiful and the napkin rings are adroable. Neat, I don't do Facebook though! Is that the only way you could get the coupon? They email me all the time with sales, but I don't think I got that! Great table, love the dishes! Diann, I adore your plates! They are so, so cute! You do a great job being thrifty and I admire your ingenuity and creativity in doing so. 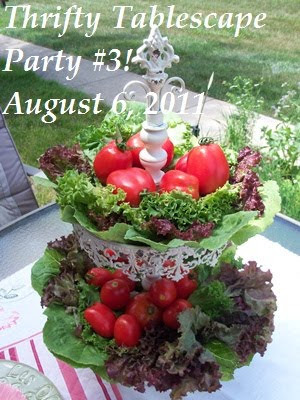 Very fun and thrifty tablescape! The square plates are very cheerful. I was amazed that the Pier1 napkin rings had been marked that low and then you go and get them even cheaper. Diann, you do have a knack for finding a beautiful bargain! I love the arrangement. very creative. Those round the world plate settings look such fun!